The light energy delivered by BBL will gently heat the upper layers of your skin. The heat absorbed by the targeted areas will stimulate your skin cells to regenerate. This corrective process will restore your skin to its natural beauty, making it clearer, smoother, vibrant and younger looking. BBL allows your clinician to treat age spots, small facial veins, and many other skin conditions. The procedure is typically gentle and safe. Generally, there is no need for a topical anesthetic; however, your clinician may choose to use it. Your eyes will be protected with safety shields or glasses. You may briefly feel a warm or “rubber band snap” sensation as the light is absorbed by the targeted areas. Your procedure may take as little as a few minutes depending on the size of the area to be treated and the type of procedure performed. Your clinician will discuss all of your options with you including the benefits, risks and what to expect. You may experience some redness that should resolve within a few hours, depending on the level of intensity of the treatment. For some spots, you will see a darkening of the treated areas followed by fading and flaking off at a later stage. 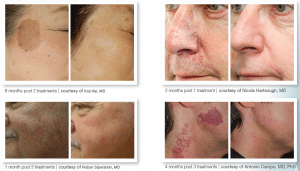 Results depend on your skin type, the number of treatments, and the area treated.